Once you have rolled the bees in the sugar mix, shaken it over a water-filled container and the sugar has dissolved in the water, examine the water's surface. You need to be on the lookout for three parasites, in particular, that are not known on the Australian mainland. Despite strict quarantine measures, they could appear here. All beekeepers must be on vigilant so we can catch and contain any incursions. Any spread would be serious to bee populations and the apiary industry. 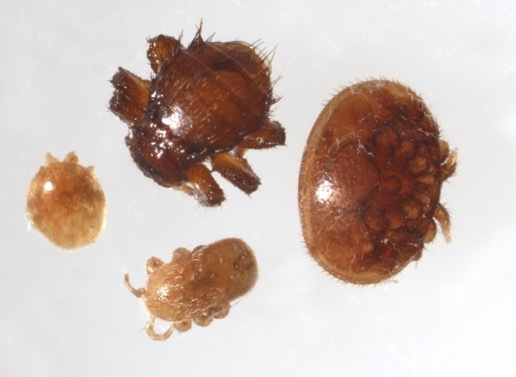 Clockwise from top: Braula fly, varroa mite, tropilaelaps mite and pollen mite. Varroa mites are found in nearly every country with honey bee populations, except for Australia. It's important for beekeepers to understand how varroa spread and to know how to identify them. For comprehensive information, check out BeeAware. Also, test your knowledge with this quiz. This mite is found overseas as close as Papua New Guinea. They mainly live in brood cells and feed on developing honeybee larvae. They cause the bees to develop with stunted wings, missing legs and other deformities. They can survive on adult honeybees only for three days. Pollen mites are not harmful to bees but are found in local hives. They can look a bit like the three parasites described above. They are relatively smaller and a lighter brown. Any mites should be reported to the exotic plant pest hotline. Call the Exotic Plant Pest Hotline immediately if you detect – or think your hives may have – mites.